I was helping my wife dust my pieces and thought I would take a picture to show you, this boiler was I think made for my Grandfather by Bonds of London for his Tug "Smokey", it may not be the same one, very much alike, but there was a short article in Model Engineer, at least 40+ years ago, about a Boiler that Bonds were making for somebody. 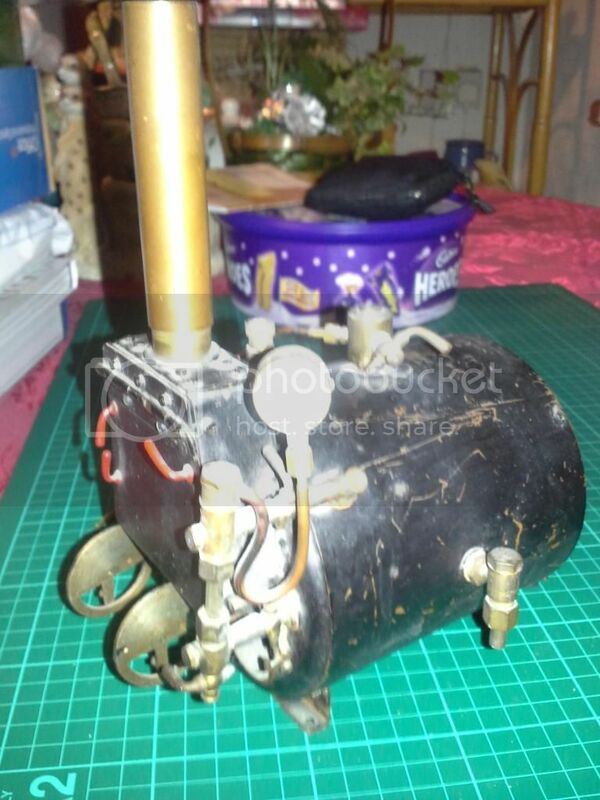 Can anybody confirm that it might be known as a Scotch Boiler. Quite possibly - short with fire hole and flue at the same end. Twin stoke holes (if that's what they are) is unusual on a model so it looks like they were trying to make it look realistic and yes it would be a scotch type in my book. I wouldn't be surprised if it had a super heater of some kind behind the smoke box door. Have you made my day, that is one article I've never seen before, would it be possible to PM me the two pictures please. Grandad used to sail Smokey on Victoria Pond and as kids my brother and I used to break the coal up to fit into the fire box, the boiler in Smokey is a different one to the one I have, Smokey was fitted with a compound engine and later she had for a short time a Triple expansion engine, a kit from Stuarts which my mother has now. Smokey was sold at a big auction house in London to raise funds for his widow. Jesse, There are twin stoke holes. would it be possible to PM me the two pictures please. If you right click you can download them via "save link as"
Thanks, I reaslised that after posting. As a PS I have worked on this type boiler full size at a plant in Avonmouth some miles down the road from Bristol. Great fun(not) crawling in through the man hole cover with a fire hose trying to wash out the scale therein.